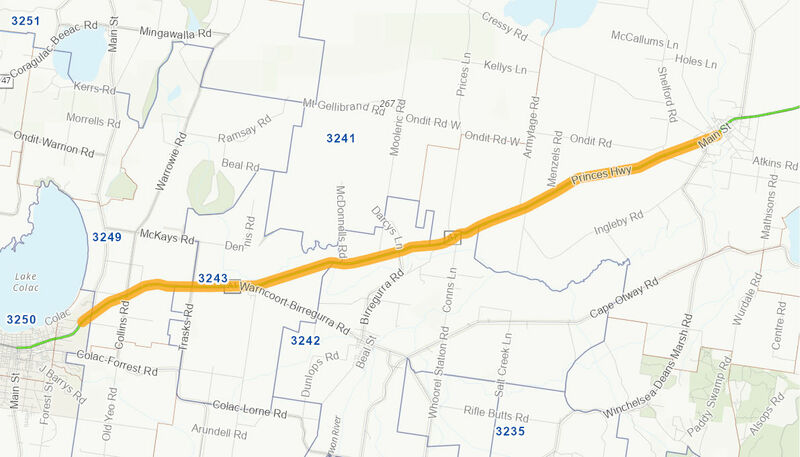 The project completed the necessary planning to duplicate 37 kilometres of the Princes Highway from Deans Marsh Road, Winchelsea to Corangamite Street, Colac. The project finalised the scope of works and completed environmental and engineering investigations, community consultation and traffic modelling. The project also completed the relevent statutory approvals. The project created a road reserve that will facilitate the future duplication of the Princes Highway between Winchelsea and Colac. The cost of the project was $9.5 million. The Australian Government contributed $7 million and the Victorian Government $2.5 million. Planning commenced on 4 July 2011 and was completed on 23 December 2016.